My dad was picking up a few things at More4 (a grocery store) when he wondered into the card isle. On top of a shelf sat this lonely looking teddy bear. He thought “Mannie will get a kick out of him.” So he scooped him up and brought the toffee colored bear home to me. I was about 10 at the time and I fell in love with the bear on first hug. The tag said he was made in England and in my ten year old mind this meant he needed a British name. The toffee colored bear would be known as Alfred. Alfred went everywhere with me (well mostly everywhere). 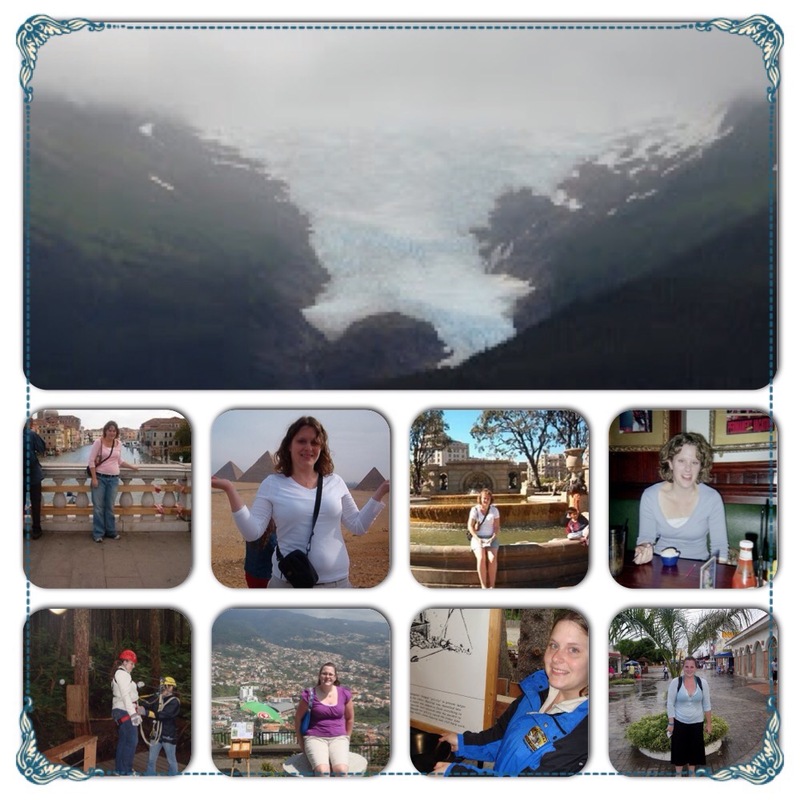 We went to church camp, conferences, on vacations and road trips. He was my safety net, the one thing I clung to at night and when I felt out of sorts. Alfred went to college, he was a good study buddy. He was safely tucked into my arms when I got on a plane with 63 strangers headed for Scotland. Surprisingly I wasn’t the only one clutching a childhood friend. If bears could have passports, Alfred’s would have more stamps than you could ever imagine. This raggedy old bear has been to: Canada, Iceland, Scotland, Sardinia, France, Spain, Italy, England, Germany, Egypt, Mexico, Belize, Alaska, Morocco, Grand Canary Islands, Portugal, and Spain again. Alfred has traveled by plane, train, metro, automobile, cruise ship, and tuck tuck. It doesn’t matter how we get there, just as long as adventure is on the horizon we will travel the globe. My Dad is the teddy bear surgeon and he has mended Alfred more times than we can count. He stitched up the hole in his neck and covered the hole in his foot with a plaid patch. Somewhere between Spain and Italy he got a hole in his right arm. 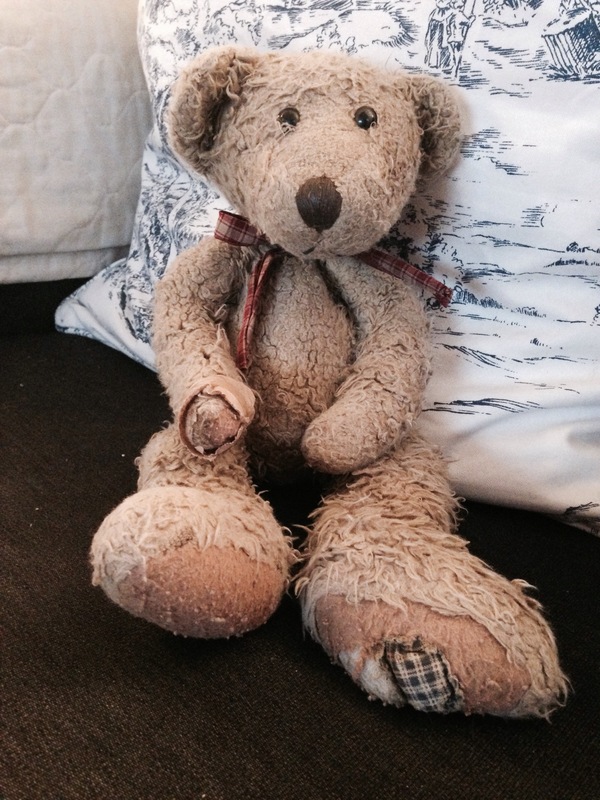 Upon my return, my Dad like many times before stitched up my old raggedy teddy bear. Alfred now sports an awesome band aide and his wounds tell the story of a well loved bear. Alfred is fragile and he doesn’t travel with me as much. Instead he sits at home and waits for my return. I hope to one day pass my raggedy old teddy bear on to my children. Have bear, will travel!